When my first baby arrived home in our cozy, one-bedroom apartment, I recall remarking that somehow he had more seating options that we did. The clutter grew and grew. And when I went back to work, I had *so* little time to deal with it. Now, even with more space (and more sleep), the “stuff” overwhelm has only gotten worse as my boys have gotten older. 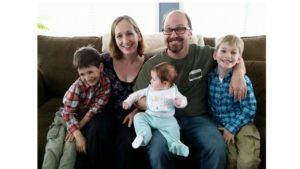 Today, I’m delighted to introduce you to Monica Taylor, a fabulous mama and alum of the Mindful Return course. With 3 boys, she has thought a lot about this topic. (Note: since this post was written, she now has 4 boys!) 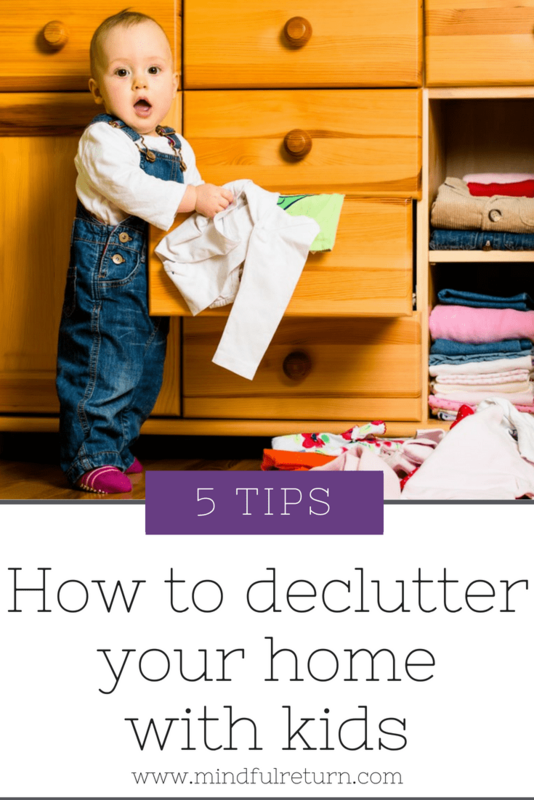 Here are her 5 awesome decluttering strategies. If there’s one way your life changes after becoming a parent (other than the being responsible for another human 24-7, the sleepless nights, etc. ), it’s all the stuff that accumulates in your home. From baby supplies, to baby gear, to baby seating options. As a mom of 3, I look back at old pictures and don’t just reminisce about how young my husband and I look pre-parenthood. But also about how clean and clutter free our home looked! It seems as if each child brought along a new set of things. And now that the older two are in elementary school (I have a third grader, a second grader and a 10 month old), it seems as if there are art projects, Legos, backpacks, and school notices, everywhere. In addition to all the baby gear for our newest addition. Besides all the stuff in our house, our schedules are cluttered. Now there are 5 people who need doctor appointments. And have sport practice. Play dates. Birthday parties. And other special events. To top it off, our minds are cluttered as well. Not only do I constantly think about what I need to do at work and home. I’m also thinking about what each child needs, what my husband needs, and what our home needs. My brain feels like it’s constantly in overdrive! Diagnose the problem, and get rid of stuff. While this sounds obvious, many people think their problem is organizing, when in reality, the problem is instead too much stuff. If you have too much stuff, you can have all the fancy organizers in the world, but your home will still look cluttered. This summer we were forced to clear out our entire bedroom for a renovation, and I was shocked at how much stuff had accumulated in our room: clothes I hadn’t worn in years, toiletries I had long forgotten about, jewelry I had purchased a while ago and had forgotten to wear, and an assortment of items I had been saving for “someday” (pictures to put into albums, books to read, etc.). “Someday” usually means never. And unless there is a particular occasion coming up when you will need to use the things you are saving, the chance of your needing the items you are saving is slim to none. I got rid of a ton of stuff from our room this summer. I have yet to miss any of the items I threw out or gave away. It made me wonder why I was holding onto all this stuff. I notice that when I have fewer items in a room, it is easier to find things. Saves me time getting ready. And I feel less anxious in general. Make it a habit: look for ways to routinely throw out, give away, and trade items. There are several charitable organizations that come directly to my door to pick up items. (Purple Heart, Lupus, Vietnam Veterans are just a few). We also donate to an organization called A Wider Circle that will pick up large items like furniture and distribute to needy families. I’ve also joined a few local list serves/Facebook groups that will list items people are selling, giving away or in search of. When we were clearing out our bedroom, the weekend before the contractors were starting work, I saw a post about a woman setting up an apartment for a refugee family in our area. We were already planning to donate our bedroom set but had not yet called a charity for pickup. This woman had access to a truck to pick up the furniture. Not only were we able to help a family in need, but we were also able to clear out several large items that needed to be moved that weekend. We really lucked out. In the same fashion, I use my networks to find items I need for free or at a low price, rather than buying new. This helps me reduce the need to save items for “someday”. There are six and a half years between my second and third child, and we had passed along many of our baby items because we simply didn’t have the room to store them. However, when I found out I was pregnant with my third, we were able to find or borrow most of the baby items we needed, including clothes, a crib, swing, bouncer, etc. from other families looking to pass on their baby items. So we really didn’t have a lot to buy when baby # 3 came along. 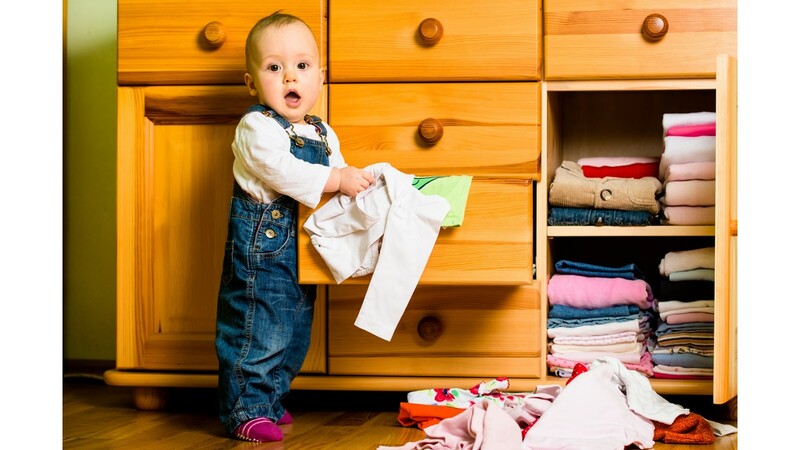 As your baby outgrows items, unless you are having a second child right away, consider passing on many of your items that take up space in your home. If you do end up needing them years down the road, chances are you will find someone more than happy to pass along their items. There are also often many upgrades and recalls to baby items, so it makes sense to have newer versions rather than save items that might expire or go to waste sitting in your attic, basement or garage. Before I had kids, my husband and I used to go out all the time: concerts, happy hours, traveling – you name it. When I had my younger two children, I felt the pressure to involve them in as many activities as possible in order to be a “good” parent (music class, sports, festivals, etc.). Our lives seemed a constant state of running from one activity to another and we were all drained. When number 3 came along, we really had to scale back on activities and be realistic about how many events we could coordinate and handle. My older boys are now in second and third grade. So I let them choose which activities they want to be involved in. One of the things they gave up was soccer. While I miss the days of cheering at games and the comradery of the team, I realized how much time was taken up by twice weekly practices, games every weekend, etc. Multiply that by two kids, and we had really been busy. It was quite a relief to have our weekends back and more time in our hectic weeknight schedule. Even if you just have a baby now, it’s easy to get caught up in signing them up for everything. Mommy and Me swim class, Daddy and Me gym time, etc. While those classes can be great, they can also shift nap times and schedules, leading to cranky babies. Sometimes everyone does much better with some much needed down time. Your baby will still grow up fine without that gym, language, or swim class. With all that a parent has to remember, teemed with sleep deprivation, it’s easy to go around in a constant state of fog. When life gets hectic, there are a few strategies I’ve found that help keep me calm and stay focused. One is to consolidate my To Do lists. While I still like to write on Post Its and make handwritten lists, I like putting items to take care of in an electronic format. Especially ones that I can share with others like my husband. We like the app Keep, which we use for grocery lists, items to pack for vacation, etc. Another strategy is to focus on gratitude, especially when life gets hectic. I like the app Bliss which gives me short journal prompts I can complete when I have a few minutes. Some of the prompts also help me focus on finding solutions to problems which have been weighing on my mind. Another strategy is to take even just a few moments for some deep breathing, meditation or yoga, to stay centered and focused. A final idea is to take a few minutes to unplug each day and just be present in the moment. A home with kids will never be immaculate, and ours is a constant work in progress. I used to feel guilty about that, and now I try to embrace this stage and focus on this saying: “Pardon our mess, our kids are busy making memories”. Enjoy your new addition and best of luck along your journey to stay organized and declutter. Monica Taylor is a mother to 4 beautiful, energetic boys, and a special education early intervention teacher. She spends her days striving for a balance between family and work life, and looking for ways to live more simply. How do you attack the clutter in your own home (and find time for said attack as a working parent)? Leave your best tips and tricks in comments below! Returning to work after maternity leave and want some support? 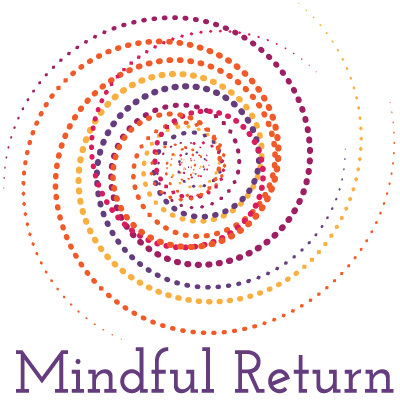 Check out the Mindful Return E-course – next session starts soon!